In addition to these novels, we will also encounter an assortment of other material, including films, short stories, critical essays, and so on. 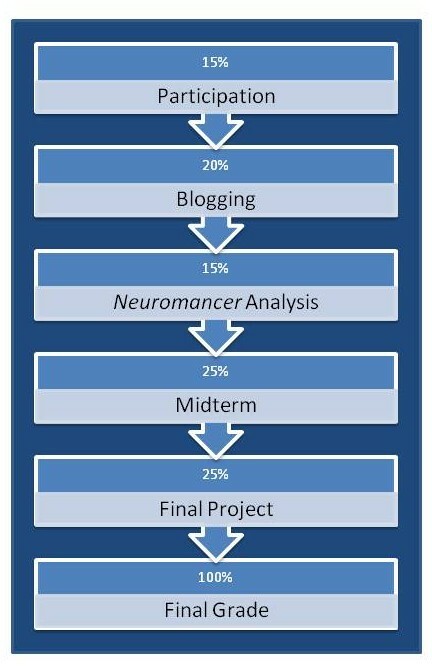 Your work for ENGH 451 is comprised of five separate categories: Participation (15%) + Blogging (20%) + Neuromancer Analysis (15%) + Midterm (25%) + Final Project (25%). The assignments in each categories are designed to enrich your understanding of science fiction, as well as to challenge you to learn from each other. (1) Participation in the day’s discussion is essential. And of course, to get the most out of the discussion, you must have read the day’s assigned work, thoroughly and critically. A portion of your class participation will take place virtually, on the social media network Twitter. We’ll begin by using Twitter passively, simply lurking. In the first days of class everyone will sign up for Twitter and begin following notable science fiction writers. A few weeks later we will begin using Twitter more actively, as what is called a “backchannel,” streaming real-time comments about the course both in and outside of the classroom. More details will follow. (2) Early in the semester every student will establish his or her own blog. Even if you already have a personal blog, I recommend you to set up a separate one for this class using OnMason, a free blog-hosting service run by GMU’s Office of Student Media. You can also get a free blog from WordPress.com. Once everyone has a blog, we will form eight groups; each group will form a self-contained reading collective. You will read and comment on the posts of the other students in your group. Every student is required to post at least once a week (either by Monday at midnight or Wednesday at midnight, a rotating schedule that depends upon your last name). Posts should run between 200-300 words. There is no make-up for missed posts. The posts can take many forms. Sometimes I will provide specific prompts for you to consider in your post. Other times your blog entry may be more open-ended. There are a number of ways to approach these open-ended posts: consider the course material using critical approaches you’ve used before; write about an aspect of the day’s reading that you don’t understand, or something that jars you; formulate an insightful question or two about the reading and then attempt to answer your own questions; or bring in some outside links or resources online, and explain their significance and connection to our class. Your post can also be a direct response or comment (using the comment feature) to another group member’s post. When you respond to another student’s post, you can build upon it, disagree with it, re-think it, or connect it to other blog posts. In every case, strive for thoughtfulness and nuance. 4 Exceptional. Focused and coherently integrates examples with explanations or analysis. Demonstrates awareness of its own limitations or implications, and it considers multiple perspectives when appropriate. Reflects in-depth engagement with the topic. 3 Satisfactory. Reasonably focused, and explanations or analysis are mostly based on examples or other evidence. Fewer connections are made between ideas, and though new insights are offered, they are not fully developed. Reflects moderate engagement with the topic. 2 Underdeveloped. Mostly description or summary, without consideration of alternative perspectives, and few connections are made between ideas. Reflects passing engagement with the topic. 1 Limited. Unfocused, or simply rehashes previous comments, and displays no evidence of student engagement with the topic. 0 No Credit. Missing or consists of one or two disconnected sentences. (3) A short analysis of Neuromancer using a single word as your focal point. In this analysis you’ll track the occurrence of one word in the novel (using Google Book’s search feature), and investigate the way that word functions in the novel, and how the novel itself functions around that word. (4) A take-home midterm paper, which will consist of a set of essay questions, as well as a reflection about the class blogging so far. (5) A final project, for which there will be a number of creative options. Students are responsible for verifying their enrollment in this class. The last day to add this course is September 6, 2011. The last day to drop this course without tuition penalty is September 6, 2011. After the last day to drop a class, withdrawal from ENG 451 requires the approval of the dean and is only allowed for nonacademic reasons. Attendance is mandatory (excepting medical emergencies or observation of religious holidays). More than four absences will lower your class participation grade by at least one letter grade. More than six absences will result in a zero for your class participation grade. Mason is an Honor Code university; please see the University Catalog for a full description of the code and the honor committee process. The principle of academic integrity is taken very seriously and violations are treated gravely. What does academic integrity mean in this course? Essentially this: when you are responsible for a task, you will perform that task. When you rely on someone else’s work in an aspect of the performance of that task, you will give full credit in the proper, accepted form. Another aspect of academic integrity is the free play of ideas. Vigorous discussion and debate are encouraged in this course, with the firm expectation that all aspects of the class will be conducted with civility and respect for differing ideas, perspectives, and traditions. When in doubt (of any kind) please ask for guidance and clarification. Laptops and smart phones may be used in class but only for classroom activities such as note-taking. Text messaging unrelated to class is not acceptable. The use of MP3 players and portable game systems during class is also unacceptable. If you are a student with a disability and you need academic accommodations, please see me and contact the Office of Disability Services (ODS) at 993-2474. All academic accommodations must be arranged through the DRC.